If you were asked right now to make a list of what matters most in your life, could you do it? If that list couldn't include material things like your house, car, expensive toys, etc., how would the list change? On the surface, it sounds like a simple task - make a list of what matters. 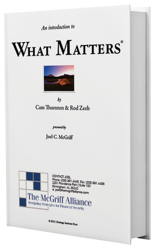 Download this Introduction to What Matters to learn how to take the first steps to discovering what matters to you.